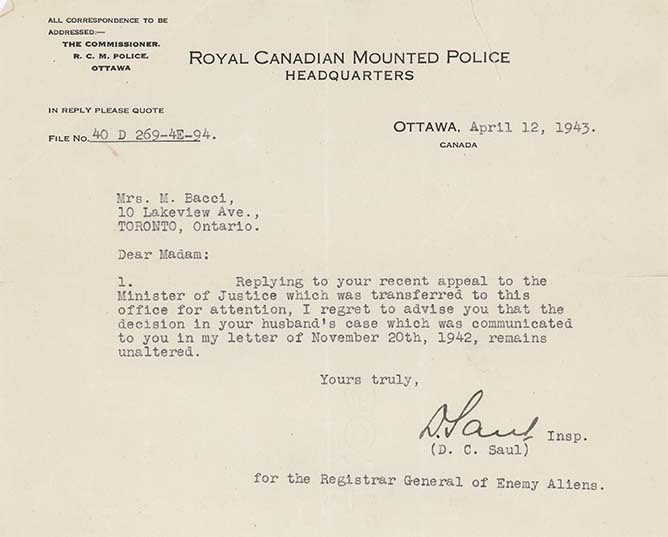 Letter from D.C. Saul (RCMP Inspector for Registrar General of Enemy Aliens), to Mrs. M. Bacci, April 12, 1943. In this letter, the R.C.M.P. Inspector writes to the wife of internee Ruggero Bacci. The writer tells the wife that her husband will remain interned, with no changes since the last communication (see LICEA2012-0002-0057). According to family, Bacci's wife Erminia (Minnie) suffered a serious nervous breakdown and was hospitalized at length. His oldest son Aldo was forced to quit high school to help support the family. When his father was released and returned home, Aldo received notice that he was conscripted into the Canadian Army; however, he did not serve overseas.